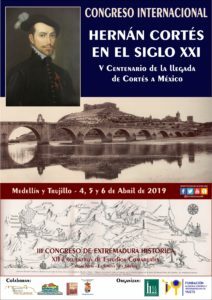 The European and Ibero-American Academy of Yuste Foundation and the Extremadura Histórica Federation call for the International Congress “Hernán Cortés en el siglo XXI. V Centenario de la llegada de Cortés a Méjico” (“Hernán Cortés in the 21st Century. 5th Centenary Since the Arrival of Cortés in Mexico”), which intends to commemorate the arrival of Hernán Cortés in Mexico and will take place from the 4th to the 6th of April 2019 in Medellín and Trujillo (Extremadura, Spain). – To delve into the historical research on Hernán Cortés in the context of the 16th century. – To disclose the historical transcendence of Hernán Cortés from the stand of scientific knowledge and his polyhedral personality. – To contribute to eradicate the black legend and the consequential “historical guilt complex” related to the Mexica Empire’s colonisation and conquest. – To value and disclose the worthy historical, social, cultural and economic legacy that Hernán Cortés’ colonising work left Modernity.